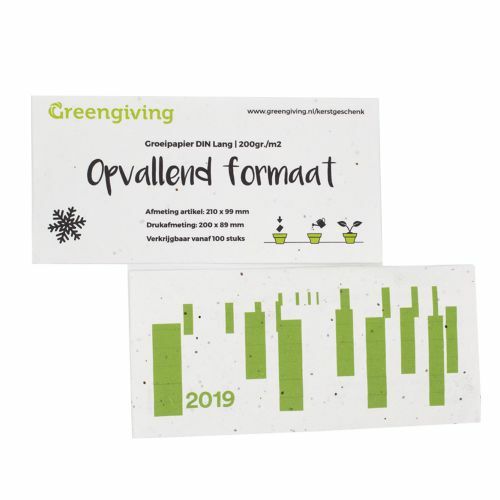 Greengiving supplies Seed Paper in any size with any print. Our standard formats are A4, A5 and A6. 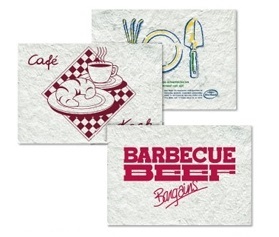 Seed Paper in these formats can be used in many different ways. For example, mail shots, flyers, or even a Seed Paper card! 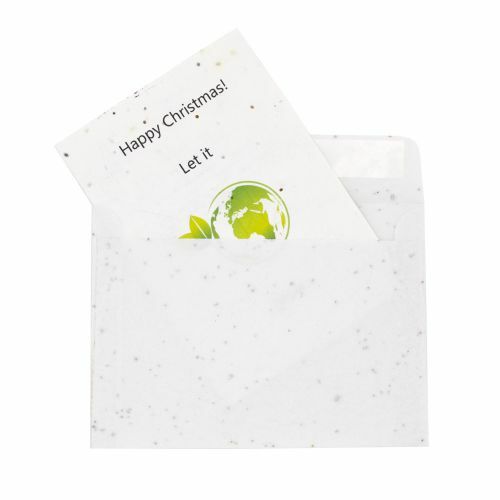 Our environmentally friendly Seed Paper conveys your message to your associates or clients in an original and green way. Placemat with seeds of summer flowers! With Seed Paper, your message lives on. After the print has been read, the paper can be buried in the ground. If you put the paper in a pot, ensure it gets sufficient water and sunlight. If the soil is kept sufficiently moist, you can enjoy cheerful summer flowers in a few weeks! Seed Paper contains a standard mix of summer flowers, but basil and other seeds are available on request. For example, in the past we have supplied clients with Seed Paper containing bee mix, forget-me-nots, poppies, herbs and vegetable seeds. As you can see: the possibilities are endless. 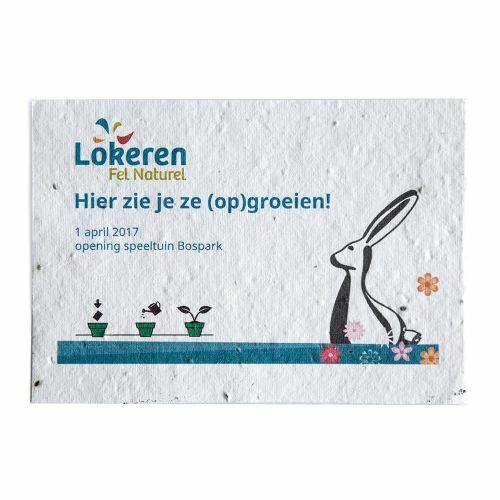 Seed Paper, both printed and unprinted, is very easy to order online. Unprinted Seed Paper is available in small runs from just 25 units. 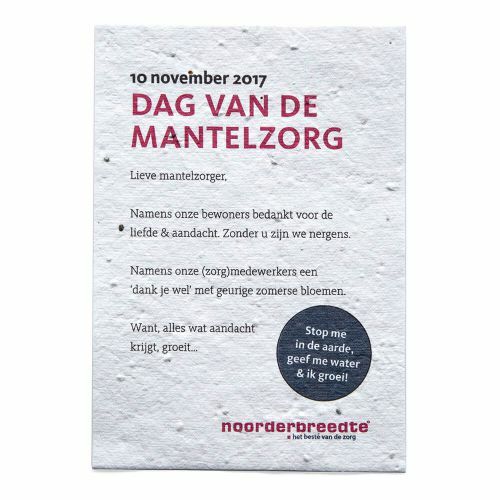 However, you must take care to print the Seed Paper with an inkjet printer only, otherwise the seeds will get burned and can no longer germinate. We can also print the Seed Paper for you, we provide full colour, razor sharp printing (it is not possible to print block colours). 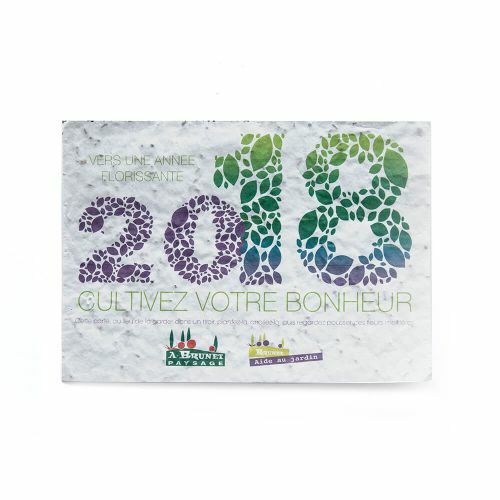 A wonderful, green and sustainable means of promotion!